My feet can’t repel firepower of that magnitude! George is a repeat geek who just had to share his latest tattoo. And I’m glad he did. He says this piece was originally going to go above his geek back piece but it wouldn’t fit right. 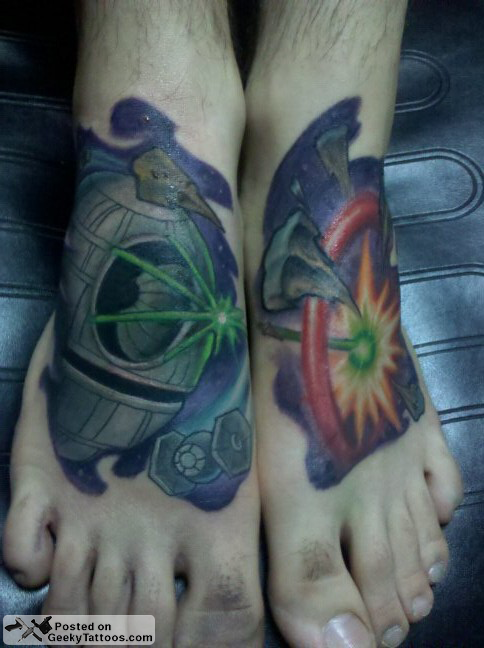 He joked about putting it on his feet, which resulted in 4 hours of pain and the tattoo you see above: an awesome depiction of the Death Star blowing up Alderaan. The foot torture was done by Tony Touch at Infinite Art Tattoo. Tagged with Alderaan, DeathStar, feet, Infinite Art Tattoo, Star Wars, Tony Touch.